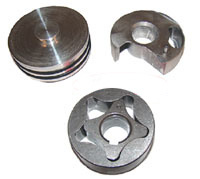 If you are rebuilding your Weber engine, and /or have experienced any type of internal bearing or gear failure we recommend replacing the complete oil pump assembly. Any blemishes, nicks or scuffing in the oil pump gears or cover will reduce oil pump pressure. Renewing the complete assembly can reduce a potential failure from reduced oil pressure.